Introduction to Design and Analysis of Experiments explains how to choose sound and suitable design structures and engages students in understanding the interpretive and constructive natures of data analysis and experimental design. Cobb's approach allows students to build a deep understanding of statistical concepts over time as they analyze and design experiments. The field of statistics is presented as a matrix, rather than a hierarchy, of related concepts. Developed over years of classroom use, this text can be used as an introduction to statistics emphasizing experimental design or as an elementary graduate survey course. 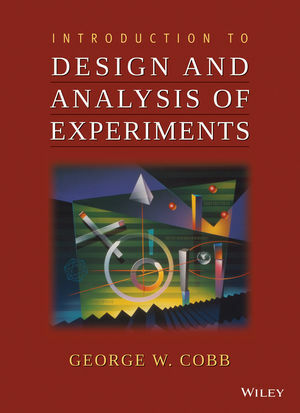 Widely praised for its exceptional range of intelligent and creative exercises, and for its large number of examples and data sets, Introduction to Design and Analysis of Experiments--now offered in a convenient paperback format--helps students increase their understanding of the material as they come to see the connections between diverse statistical concepts that arise from the experiments around which the text is built. Whether catapulting gummy bears to demonstrate to his students the fundamentals of experimental design or chairing national committees on undergraduate education in his field, George Cobb is always focused on finding new and better ways to teach statistics. Beginning in the 1980s he was in the vanguard of those who radically altered courses in introductory statistics as computers liberated them to set their students to work with real data. In recent years Cobb has turned to the content and pedagogy of more advanced classes. He has successfully sought ways to engage students from widely diverse academic backgrounds in courses that simultaneously explore mathematics and statistics. 1. Introduction to Experimental Design. 1. The Challenge of planning a good experiment. 2. Three basic principles and four experimental designs. 3. The factor structure of the four experimental designs. 2. Informal Analysis and Checking Assumptions. 1. What analysis of variance does. 2. The six fisher assumptions. 3. Informal analysis, part 1: parallel dot graphs and choosing a scale. 4. Informal analysis, part 2: interaction graph for the log concentrations. 3. Formal Anova: Decomposing the Data and Measuring Variability, Testing Hypothesis and Estimating True Differences. 2. Computing mean squares to measure average variability. 3. Standard deviation = root mean square for residuals. 4. Formal hypothesis testing: are the effects detectable? 5. Confidence intervals: the likely size of true differences. 4. Decisions About the Content of an Experiment. 5. Randomization and the Basic Factorial Design. 1. The basic factorial design (“What you do”). 3. Factor structure (“What you get”). 4. Decomposition and analysis of variance for one-way BF designs. 5. Using a computer [Optional]. 6. Algebraic notation for factor structure [Optional]. 6. Interaction and the Principle of Factorial Crossing. 1. Factorial crossing and the two-way basic factorial design, or BF. 2. Interaction and the interaction graph. 3. Decomposition and ANOVA for the two-way design. 4. Using a computer [Optional]. 5. Algebraic notation for the two-way BF design [Optional]. 7. The Principle of Blocking. 1. Blocking and the complete block design (CB). 2. Two nuisance factors: the Latin square design(LS). 3. The split plot/repeated measures design (SP/RM). 4. Decomposition and analysis of variance. 5. Scatterplots for data sets with blocks. 6. Using a computer. [Optional]. 7. Algebraic notation for the CB, LS And SP/RM Designs. 8. Working with the Four Basic Designs. 1. Comparing and recognizing design structures. 2. Choosing a design structure: deciding about blocking. 4. Recognizing alternative to ANOVA. 9. Extending the Basic Designs by Factorial Crossing. 1. Extending the BF design: general principles. 2. Three or more crossed factors of interest. 4.Graphical methods for 3-factor interactions. 10. Decomposing a Data Set. 1. The basic decomposition step and the BF design. 2. Decomposing data from balanced designs. 11. Comparisons, Contrasts, and Confidence Intervals. 1. Comparisons: confidence intervals and tests. 2. Adjustments for multiple comparisons. 3. Between-blocks factors and compound within-blocks factors. 4. Linear estimators and orthogonal contrasts [Optional]. 12. The Fisher Assumptions and How to Check Them. 2. Independent chance errors (I). 3. The normality assumption (N). 4. Effects are additive (A) and constant (C). 5. Estimating replacement values for outliers. 13. Other Experimental Designs and Models. 1. New factor structures built by crossing and nesting. 2. New uses for old factor structures: fixed versus random effects. 3. Models with mixed interaction effects. 4. Expected mean square and f-ratios. 14. Continuous Carriers: A Visual Approach to Regression, Correlation and Analysis of Covariance. 2. Balloon summaries and correlation. 15. Sampling Distributions and the Role of the Assumptions. 1. The logic of hypothesis testing. 2. Ways to think about sampling distributions. 3. Four fundamental families of distributions. 4. Sampling distributions for linear estimators. 5. Approximate sampling distributions for f-ratios. 6. Why (and when) are the models reasonable?